Francis Noel Butler was born in Eaton Socon, Bedfordshire, in 1875/76, the son of Francis George (a solicitor) and Eleanor Butler (nee Wilkinson). By 1901, Francis was a solicitor by profession with the family living at Crosshall Lodge in Eaton Socon, and in 1906 he married Mary Desborough. Initial searches suggest they do not appear to have had any children. Francis joined the Huntingdonshire Volunteer Force as a Captain in 1900 and in January 1909 was promoted to a Major in the recently formed 5th (Territorial) Battalion of the Bedfordshire Regiment. He gained promotion to Lieutenant Colonel and commanded the 5th battalion between 20 January 1912 and 25 January 1915, at which time he resigned his commission due to a serious bout of influenza. From November 1914, he opened his house up for the Red Cross to treat wounded soldiers and by the time his wife asked for it back in October 1916, over 200 patients had passed through their doors. After his recovery, Lieutenant Colonel Butler returned to the regiment and was posted to France following the British army's losses in 1916. He commanded the 1st Battalion on the Western Front between December 1916 and May 1917 after which time he was attached to the 11th Essex. Over the summer of 1917 local newspaper reports told of him returning to hospital in England suffering from Trench Fever but any service beyond then is not obvious and his service record was either lost in the Blitz, or is still in the keeping of the MOD. Lieutenant Colonel Butler died on 26 March 1935, at his home in Eaton Socon, leaving a widow. Major John Edgar Hill, O.B.E., T.D. John Edgar Hill was born in 1886 and left Oxford with a 2nd Class M.A. Honours degree in Modern History. After his schooling had finished, he enlisted into the 1st Battalion of the Oxfordshire Volunteer Brigade (The Oxfordshire Light Infantry) on 19 October 1905. On 17 May 1909 he was commissioned as a Second Lieutenant and posted to the 5th Battalion of the Bedfordshire Regiment. April Fool's Day 1911 saw John promoted to a Lieutenant and 2 May 1913 saw him rise to the rank of Captain. From 25 May 1915 he served as a temporary Major until it was finally substantiated on 27 October 1921. When the 5th Battalion sailed for Gallipoli in July 1915, John was the second in command and landed with them on Gallipoli early on 11 August. 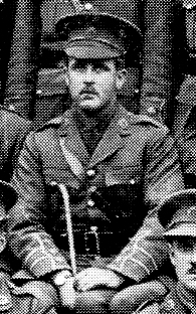 During their first battle on 15 August 1915, he "performed prodigies of valour" by running between the spread out groups of Bedford's left after their assault to keep the unit coherent. Ever watchful and never still for a moment, he noted the plight of Lieutenant Shoosmith's Machine Gun section who were attracting so much Turkish artillery fire that only Shoosmith and one other man were left. He dashed across the shrapnel swept ground and found Shoosmith "merrily hammering away at the Turks" despite the attentions of their artillery. Major Hill slid to a halt next to the focused Shoosmith and asked "Who is to fight the gun if you get knocked out? No one else knows enough about it up here; your section is gone and you had better show me how to do it". "Oh, you just pull this and press that; it's quite simple" came Shoosmith's breezy reply as he continued "pumping hell into the Turks". That night, Major Hill took charge of the forward remnants of the battalion as they grimly held onto the position they had just won at such a dreadful cost and continuously moved between the posts ensuring his men were focused and in good spirits. His handling of the battalion over the next two months impressed his superiors, so much so that on 23 October 1915 he was posted as Staff Captain in the 162nd Brigade. A year later he moved to D.A.A.G. in the Delta Force, Egypt where he served between 28 October 1916 and 20 February 1919. During his service in the Delta Force, Major Hill was awarded the O.B.E. (Military Division) for services rendered in the war and was mentioned in General Sir E.H.H. Allenby's dispatches on 23 October 1917 and 23 October 1918. On 29 January 1921, Major Hill left the Middle Eastern theatre and headed home, arriving Valentines Day, 14 February 1921. On 19 February 1921, he requested to resign his commission on the grounds of being unfit due to Nephritus resulting from the dysentery he had suffered whilst on active service. His resignation was finalized on 11 July 1921 although he retained the rank of Major. On 28 September 1921 John lived at 9 Regents Court in London NW1, having spent the previous six months in New York on business. Major John Hill can be seen here in the 1915 Officers group photograph, sitting fourth from the end of the third row. Away from his military life, John Hill was also the director of the London Brick Company. He and his wife Dorothy had a holiday home in Frinton-on-Sea in Essex, and were members of the local golf and tennis clubs. Whilst the battalion were still in England in 1914, Ernesto was their Transport Officer who was seemingly capable of procuring absolutely anything, regardless of how unusual or bizarre the item was! Among other events, this even involved "requisitioning" a coal lorry and fitting it onto their transport train despite the dimensions insisting it could not be achieved, and although he apparently neglected to inform the owner he was taking it. The "rather short gentleman with the twinkling eyes" relinquished his transport duties on his own request to the young 2/Lt Miskin whilst still in England. During the the 15th August 1915 battle Ernesto was posted missing but turned up several days later suffering from severe sunstroke, having been out in no-man's land for several days. He moved to the RAF in 1916 and survived the war but not much information seems to be available on him, despite him being such an obvious character. He is also shown in the 1915 photographs here.